This rustic-glam centerpiece is great for any setting. I originally made it because I had to make centerpieces for husband’s family reunion. While I was scrolling through Pinterest looking for inspiration, I came across this pin. I loved the look of jute twine, pearls, and wire all together so I decided to add my own flair to it. They turned out so well that I decided to make some for home too. I first purchased some mason jars. I made sure that they had smooth sides without any words on them. If you don’t like the look of mason jars, you can even use vases. I love to use the cylinder vases from the Dollar Tree. 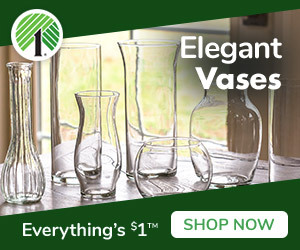 Glass Cylinder Vases, 9 in. Ship It To Your Local Dollar Tree Store For FREE*! I started off by hot gluing the jute twine around the top portion of the mason jar (or vase). I used a spool of wire my husband had in the garage, used wire cutters to cut it, and then put it through some ivory beads. I just estimated the length of the wire, I didn’t measure it. You can use as much or as little as you’d like. Make sure you clamp one end of the wire so the beads don’t fall off. After you put the wire through your desired amount of beads, clamp the other end and wrap it around the twine area. Make sure to move the beads around so they’re proportionate. Since I already had the wire, I decided to do it this way. If you want to use a simpler method, you can buy beaded wire garland from Amazon or even locally. There will probably be excess hot glue on the vase, so make sure to clean that off. I decided to print out pictures with copy paper at home instead of using regular pictures. I wanted the light from the LED candle to shine through the paper. I printed 3.5 x 5 pictures, and that worked perfect for me. You could always play around with it if that size does not work for you. Keep in mind, you don’t have to use a picture, you can also print out a quote or saying. The last step is to put your flameless LED candle at the bottom of the jar, and you’re done. Now you have a versatile centerpiece that can be used for so many different occasions. These are beautiful! And so simple to make. Thanks for sharing! Such a cute a simple centrepiece idea! Will have to try this! Great Article! Thank you for sharing. I have many mason jars I could use. I can see how these would be great for weddings, graduation parties, or on the beach. Love it! Love the look of this centerpiece. I was looking for something that would be classy and down to earth for my mother’s memorial service and this is perfect.